Nanoparticles, superstrong and flexible structures such as carbon nanotubes that are measured in billionths of a meter — a diameter thousands of times thinner than a human hair — are used in everything from microchips to sporting goods to pharmaceutical products. But large-scale production of high-quality particles faces challenges ranging from improving the selectivity of the synthesis that creates them and the quality of the synthesized material to the development of economical and reliable synthesis processes. However, this situation could change as a result of research at the U.S. Department of Energy's (DOE) Princeton Plasma Physics Laboratory (PPPL), where scientists have developed the diagnostic tools that are being used to advance an improved and integrated understanding of plasma-based synthesis — a widely used but poorly understood tool for creating nanostructures. PPPL scientists and collaborators outline, in several published papers, recent research that could help to develop controllable and selective fabrication of nanomaterials with prescribed structures. Such basic research could pave the way toward manufacturing advances in a variety of industries. The papers report unique observations of the synthesis in carbon plasma generated by an electric arc in situ, or as the process unfolds. Researchers create the plasma arc between two carbon electrodes, producing a hot carbon vapor composed of atomic nuclei and molecules that cool and synthesize — or condense — into particles that grow into nanostructures by bunching together. Direct observation has produced "a big step forward in understanding how carbon nanoparticles grow in plasma generated by arc," said physicist Yevgeny Raitses, head of the Laboratory for Plasma Nanosynthesis at PPPL. "The idea now is to combine experimental results with computer modeling for improved control of the process and to apply what we learn to other types of nanomaterials and nanomaterial synthesis." Following is a look at three papers that break new ground in unraveling the poorly understood arc synthesis process. Support for this work comes from the DOE Office of Science). Spotting precursors that become nanotubes. Missing from today's knowledge is a detailed understanding of the precursors of nanotubes that are formed from the vapor during synthesis. This poses a key challenge for predicting the mechanism for nanosynthesis with a carbon plasma arc. Shedding light on this process are new discoveries at PPPL. Research led by physicist Vladislav Vekselman and reported in the journal Plasma Sources Science and Technology shows that what governs the synthesis of carbon nanotubes in a purely carbon electric arc is molecular precursors that include "dimers" — molecules formed by two carbon atoms. This finding opens the door to improved predictive modeling of nanosynthesis in carbon arcs. "This is the first time that a laser-induced diagnostic technique has been applied to this type of synthesis," Vekselman said. "We now know where and how much precursor is formed in carbon arc material." Supporting these findings are simulations of carbon arc synthesis conducted by PPPL physicist Alexander Khrabry. "Our models are based on the underlying physics of vaporization, condensation and the formation of nanostructures," said physicist Igor Kaganovich, deputy head of the PPPL Theory Department. "We apply this to results of the in situ experiments to develop predictions that can be tested with further experiments." Such predictive models have begun to make progress. "Having in situ measurements while synthesis takes place is a very valuable aid to understanding and modeling," said Brent Stratton, head of the diagnostics division of PPPL and deputy director of the Plasma Science and Technology (PS&T) Department that houses the nanosynthesis laboratory. "What this project shows is the combined value of experiments and modeling for deepening understanding of plasma arc synthesis." Detecting nanoparticle growth. To further such understanding, researchers must monitor the production of particles in sizes ranging from nanometers all the way down to the atomic scale. PPPL research has now built and demonstrated a unique table-top laser technique for in situ detection of nanoparticle growth. "This custom-made diagnostic helps piece together the puzzle of plasma arc nanosynthesis," said physicist Alexandros Gerakis of PPPL, who designed the technique and is lead author of its description in the journal Physical Review Applied. "There had previously been no good way to monitor the process." The novel method, derived from a prediction by Mikhail Shneider of Princeton University, detects particles that flow within and from the electric arc. The technique observes particles some five nanometers in size, and could be used to measure materials created by other forms of nanosynthesis as well. Such in situ measurement of nanoparticles during large-volume synthesis could advance understanding of the mechanisms behind nanoparticle growth. Why some synthesis goes wrong. Among the most promising types of nanomaterials are single-wall carbon nanotubes that carbon arc discharges can produce on an industrial scale. But a key drawback to this method is the impurity of much of the synthesized nanomaterial, which includes a mix of nanotubes, carbon soot and random carbon particles. A chief source of these drawbacks is the unstable behavior of carbon arcs, PPPL has found. Such behavior creates two modes of production, which the laboratory calls "synthesis-on," for pure nanotube fabrication, and "synthesis-off," for impure results. "The synthesis in plasma arcs is 20 percent on and 80 percent off," said physicist Shurik Yatom, lead author of the results published in the journal Carbon. In these experiments, Yatom used a conventional arc synthesis technique and filled one of the two electrodes — called an "anode" — with graphite powder and a catalyst and found that the synthesis was erratic, switching between the dominant synthesis-off mode and the far less common synthesis-on mode. Fast-camera images, electric characteristics and emission spectra showed that the arc engaged the contents of the anode directly in the synthesis-on mode, but oscillated around the hollow anode in the synthesis-off mode and was unable to interact with the powdered graphite and catalyst inside. The team also constructed a probing device to selectively collect the synthesized product between the two modes. Evaluating the synthesized nanomaterials was Rachel Selinsky of Princeton University, who found that the vast majority of nanotubes were collected during the "synthesis-on" mode. The findings revealed the need for stabilizing the arc so that it constantly engaged the graphite and catalyst for the continuous production of single-wall carbon nanotubes. The paper proposes several pathways going forward, ranging from the use of thinner-walled to solid composite anodes for producing nanotubes in a continuous manner with fewer unwanted byproducts. Finally, understanding the cause of such impurities is crucial for future research at PPPL and elsewhere. As scientists continue to develop methods of in situ characterization for nanostructures, they must monitor the arc behavior and distinguish between results obtained in the synthesis-on and synthesis-off modes. Going forward, PPPL conducts in situ measurements of plasma nanotubes synthesized from boron nitride, a promising material with aerospace and electronics applications. Collaborating on this work are professors Roberto Car of Princeton University, Predrag Kristic of the State University of New York at Stony Brook, and Bruce Koel of Princeton. Overseeing PPPL nanosynthesis projects is Phil Efthimion, head of the PS&T Department. Following are coauthors of the papers. 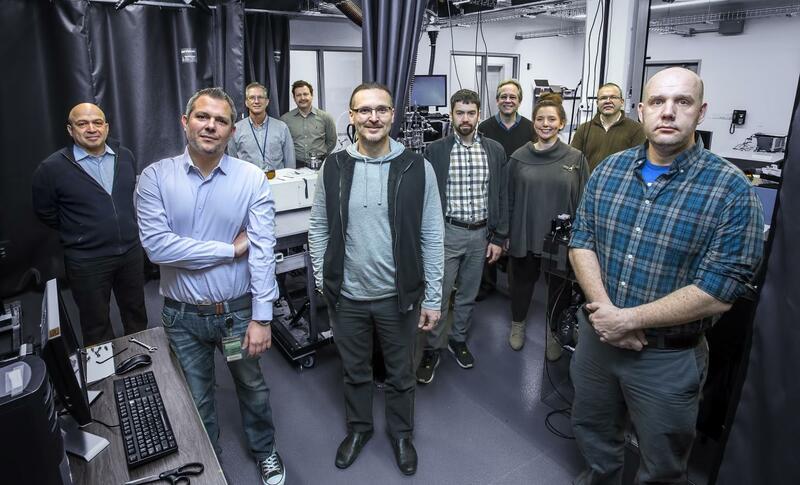 Nanoparticle precursors: Vladislav Vekselman, Alexander Khrabry, Igor Kaganovich, Brent Stratton and Yevgeny Raitses of PPPL, and Rachel Selinsky of Princeton University. Detecting nanoparticle growth: Alexandros Gerakis, James Mitrani, Brent Stratton, and Yevgeny Raitses of PPPL, Yao-Wen Yeh and Mikhail Schneider of Princeton University. Synthesis on and synthesis off: Shurik Yatom and Yevgeny Raitses of PPPL, Rachel Selinsky and Bruce Koel of Princeton University.